Mix the vanilla mayonnaise with the soured cream and add thediced salmon. Add a squeeze of lemon and stir to combine. Put a little shredded lettuce in the bottom of 8 shot glasses, top each glass with the diced salmon and mayonnaise mixture. 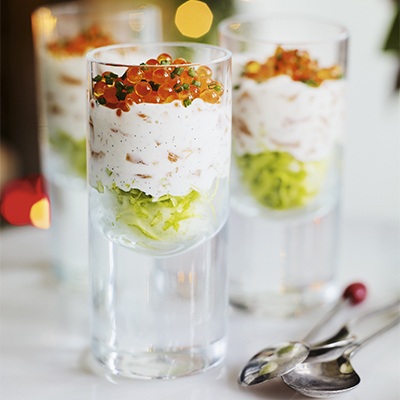 Garnish the top with a layer of rinsed salmon roe and sprinkle with finely chopped chives.